Calling all pizza lovers! This kosher-meets-pizza recipe is perfect for any occasion as it serves six people and only takes a total time of 30 minutes for cook and prep. This pizza recipe will always having you craving another bite! 1. Preheat oven to 350℉ (180℃). 2. Cut puff pastry sheet in half. Place each half on a parchment-lined baking sheet. 5. While the puff pastry is baking, prepare the toppings. 6. For the broccoli layer, combine olive oil, white wine, hot sauce, garlic, salt, pepper, and thyme in a medium-sized bowl. Toss in broccoli and coat completely. Set aside. 7. For the mushroom-shallot layer, heat two tablespoons olive oil in a large frying pan. Sauté the shallots for three minutes. Add the mushrooms and season with salt, pepper, and thyme. Continue to sauté for seven more minutes. Pour in teriyaki sauce and white wine and raise the heat. Stir until liquid is absorbed. 9. Combine garlic-mayo ingredients and spread over the two par-baked crusts, reserving some of the garlic-mayo for drizzling. 10. 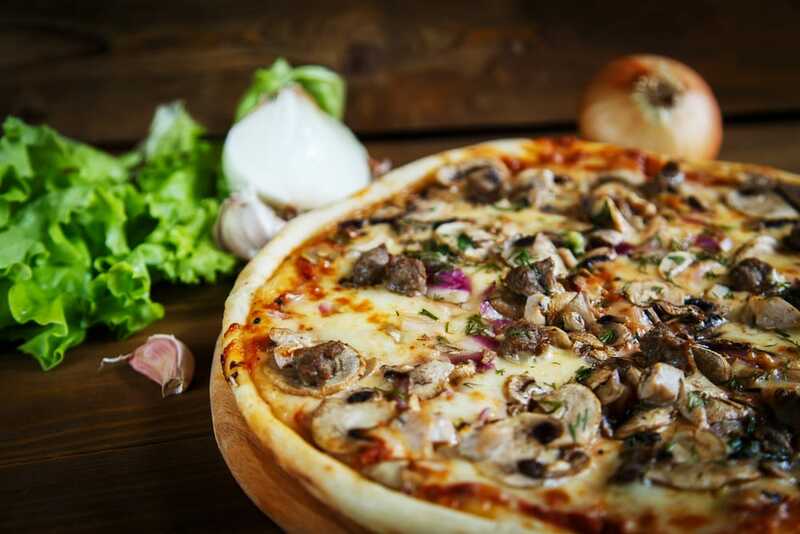 Divide the mushroom-shallot mixture evenly between the two crusts. Next, sprinkle with marinated chicken slivers and broccoli. Top with a drizzle of garlic mayo. 11. Bake for 30 minutes, or until chicken is ready.